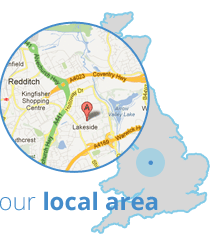 Your local supply & installation specialist covering Redditch, Birmingham & West Midlands. Pinnacle Home Improvements have many years of experience helping homeowners to update and enhance their properties. Based in Redditch, we specialise in supplying the finest quality windows and doors to customers across Birmingham and the local area, and can also construct stylish, functional conservatories to extend your living space. Whatever kind of home improvement project you are planning, you can trust our team to transform your property; leaving you with a home that you will love. As a well-established, family-run business, we pride ourselves on the quality of our service. With a product range which features a great selection of high quality windows, doors and conservatories, and a team who have extensive industry experience, we have become one of the leading local home improvement companies. We work hard to achieve a high-end finish in every project we complete, so you can feel confident that your property is in safe hands when you choose Pinnacle Home Improvements to fit your new windows in Birmingham. Every home is different, which is why we tailor our service to suit the needs of each individual client. With a fantastic range of products on offer, you will be spoilt for choice when selecting new windows and doors for your home, and with a variety of styles and finishes to choose from, it will be easy to find something to complement the look and feel of your property. We understand that cost is an important consideration when you are planning to update your property with new windows in Redditch, but thanks to our competitive prices, transforming your home needn’t cost a fortune. Why not get in touch today for a free, no obligation quotation? Call our team now on 01527 522019 or complete our quick quote form to begin your enquiry.